How to Score in Bowling? Scoring is a simple matter. It is simply a case of mastering a few basic symbols and using ordinary addition to arrive at the total score. 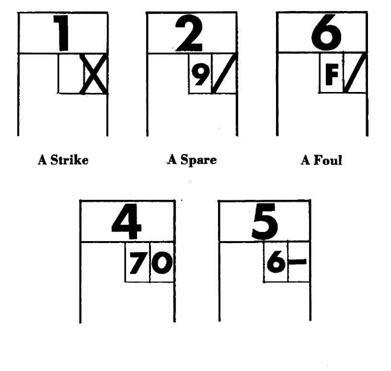 3)If you get a “strike” all ten pins with your first ball score 10 in that box, plus the number of pins you knock down with your next two balls. Thus, the maximum score in each frame is 30 representing three strikes in a row. 4)If you get a “spare” knock down all ten pins on two rolls score 10 in that box, plus the number of pins you knock down with your next ball. Thus, the maximum you could get would be 20 in that frame (for a strike following the spare).Should you knock down five pins, you would get a score of 15 in thatbox. 5)If you fail to knock down all ten pins with two balls,you simply record the number of pins you toppled. 6)The score is maintained progressively from frame to frame, as in the chart below. This entry was posted on Tuesday, November 22nd, 2005 at 11:50 pm	and is filed under Bowling. You can follow any responses to this entry through the RSS 2.0 feed. Both comments and pings are currently closed.